The records show that the founder of the Foundation was one Antony Hall, Yeoman of Snettisham, who lived in the village during the late 17th and early 18th century. 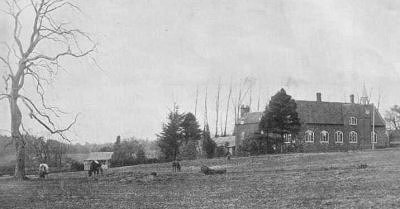 A married man, he lived with his wife and their three sons and a daughter in a house known as Cherry Hill with 5 acres of paddock. He also owned other freehold land in Snettisham, Heacham and Norwich. In 1708 was taken ill and as he lay sick he gave serious thought as what to do with his worldly goods in the event of his death. His wife had already died and he did not get on well with his children, but did approve of his grandchildren. He was a much-travelled man and realised the value of being able to read and write. He also had a strong affinity for Snettisham and its inhabitants and realised that he could perhaps help the poor of the village in the their education. In September 1708 he had his will drawn up and witnessed, in the presence of Margaret and James Disciple and Eliza Good. Antony Hall died on 14th October 1708 and later that year his will was read. In his will his eldest son Thomas was left 5 shillings if he came and asked for it, along with £5 for his son's apprenticeship. His second son, Antony, a father of two, was to receive 40 shillings per year for life. His youngest son and daughter, still of school age were placed with guardians in Norwich and they were each given £5 a year to support them. The bulk of his estate, including all land and properties, were to be used to set up a trust to supply funding for an endowed school in the village. This would be a good country grammar school. The conditions set out in the will stated that the school should take care of the proper education of 20 poor boys of Snettisham whose parents occupied property of not worth more than £20 and whose chattels did not exceed £400 in assessed value. No other free scholars would be taken unless they were descendants of Antony Hall but the school could take any number of fee- paying scholars. From 1708 to 1791 nothing was done to implement the wishes of the will regards the school. The land and property had by now passed to Antony's granddaughter, Francis Dolman and then to the Styleman family. By this time the Hall's family in Snettisham had died out. In 1792, the local vicar and a group of local residents led by Robert Foster took the case to court to get the wishes of the will moving in respect of the provision for a school. It took eight years, a very complicated and expensive court case and much documentation before judgement was given in their favour. In August 1800, nearly a hundred years after Antony Hall's death, a full account was placed before the Attorney General and the school was ready to come into existence. During this time Antony's house had fallen into disrepair and was worth very little and taxes had taken a major share of capital left. The final amount left was £409 9s 8d and the land owned in Snettisham. No school to occupy and barely enough money to build a new one. In 1801 the first Board of governor's was appointed to govern the Foundation. The first Governors were Henry Styleman, James Lay, Thomas Rand, Charles Snell, James Pretty, George Grant, Edmund Rolfe, James Coldman, Richard Ayton Lee and William Davy. In April 1802 the governors appointed a Mr Whitty, a surveyor who had drawn up plans for the new school, as the Headmaster of the school. Legal and financial problems held up the building of the school on what is now Kenside and it was not completed until 1805. Once built the financial capital left to rum the school was £35 16s 9d. 20 village poor boys were duly granted free education along with some fee paying students so the Hall's Grammar School was finally up and running. Records show that the Governors purchased an iron chest, with padlocks for the Foundations documentation for the princely sum of 8s 8d. This chest, with much of this documentation is still in our possession but minus the padlocks! In 1854 after many ups and downs, in terms of finance, numbers and academic successes the school reaches a low point and following the retirement of Mr Whitty after 50 years as headmaster, the school temporarily closes. The school reopens again with a Mr Lubbock in charge, a new and much wider curriculum and a new energy. Boarders, who were fee paying greatly increased and so did the income and soon there were 50 pupils on roll. By now accommodation was very limited and the school understaffed to meet this new success. In 1858 a loan was taken out to improve dormitory and classroom provision and for the employment of two new assistants to help Mr Lubbock. By 1873 after many successful wars the school began to suffer as a result of the increasing number of Church and School Board schools opening in the county. Our own Primary school was now competing for the same children. In 1875 the school closed again and reopened later in 1875 a under the new endowed Scheme under the headship of Mr F.W.H. Palmer. Under this system the school was paid a capitation grant to every Norfolk scholar attending. The system of free education to Snettisham boys had been annulled and was reinstated with scholarships for which they were partly sponsored. In the ensuing years fluctuating rolls, poor and inefficient teaching, limited classroom and dormitory space posed serious problems. 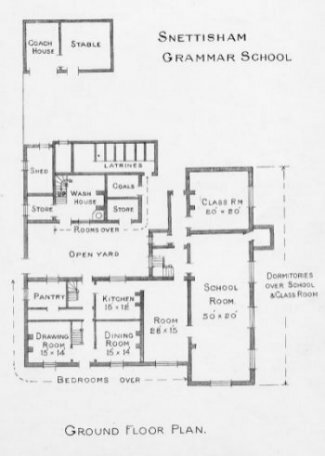 To combat this the school was extended with new classrooms, dormitory and sanatorium. The Prince of Wales gave funds for a new gymnasium. By 1897 the school reached an all time high with 81 pupils, day and boarders on its books. The quality of student was not always good but it kept the Foundation solvent. By 1902 things had taken a turn for the worse with the implementation of the new education act, the opening of King Edward Grammar School in Kings Lynn, and some poor financial investments. The school struggles on for 10 more years with very little help from Board of Education. In 1912, Mr Palmer tended his resignation and in 1913 the Board of Education finally forces the closure of the Hall's Grammar School. Snettisham boys would now be awarded scholarships to attend the Grammar School in Kings Lynn. 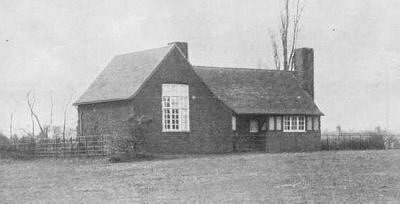 In December 1914 a public inquiry initiated by the villagers of Snettisham looked into the closure of the school. It was evident that Hall's Grammar School did not fit into the Norfolk plan and was in fact an embarrassment to them. However, the inquest did prove successful on one front. The County Council wanted the land and assets sold and invested in Consols. Instead the inquiry founded with the villagers who wanted to form a Hall's Exhibition Charitable Trust, which would benefit the education of Snettisham boys, or girls, if funds allowed it, and give scholarships to Lynn or any other Grammar School. In 1915 the Charity Commission produced the scheme, framed by the Board of Education under the Endowed Schools Acts 1869, 1873 and 1874 for the amendment of the scheme regulating Hall's Grammar School, Snettisham. The Hall's Exhibition Foundation was now officially formed. It was to be managed by a Board of Governors consisting of four County Council elected representatives, four Parish Council elected representatives and two Co-opted members. At this time it is recorded on the Scheme that the Foundation owned School Buildings and part of the playing field, Headmasters House and various pieces of land totalling approximately 50 acres. This includes a piece of land known as the Carr Stone quarry and Carr Pit Piece (sub let to E. LycettGreen for 16 years) which would later prove to be our most valuable asset. Investments at the time were in the region of £1400 bringing in a yearly income of £40 per annum. Some income was obtained during the war as the Army used the school for the billeting of soldiers. Following this there was no income from the school and a pension had to be paid to Mr Palmer. 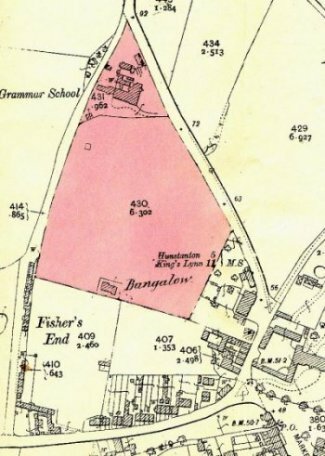 On 19th May 1920 the School, Headmasters House, Cricket Pavilion and Bungalow (old Sanatorium) and 7 acres of land were put up for auction. This was successfully sold and the school demolished to make way for much needed new housing, which is now the Kenside estate. The only remaining building, which is still occupied, is the old Sanatorium at the top end of Kenside. The Ken Hill Estate also purchased 15 acres of land they had been renting from the Foundation. Capital from these sales and the increasing royalties from the Carrstone Pit, were invested and the interest used to fund the scholarships. The building boom of the 1950's saw a rapid rise in the royalties from the quarry as the need for carrstone and other building material increased. This meant that the Foundation's income was now far exceeding the scholarships that were being given. The governors approached the Charity Commission to revise their scheme to allow for greater scope with their bursaries. In 1974 the new scheme allowed beneficiaries from outside the Parish to be considered and the age group widened to run from the beginning of secondary schooling, up to the age of 25 years, so that University and post graduate students could benefit. It also allowed the Foundation to make grants to groups as well as individuals. The disappointing aspect of the scheme was that the Foundation was unable to make grants to the local village junior school as the pupils were below the age that grants were permitted. Stock market fluctuations have seen a significant decline in the value of the Foundations capital, which is only now starting to recover to the earlier high level. The reorganisation of Primary and Secondary Schooling in Norfolk from September 2004 will mean for the first time that Snettisham. Primary School will be able to receive financial assistance from the Foundation, as they will be catering for 11 year olds. 2004 will also see the exhaustion of carrstone from the Foundations quarry, the royalties of which have swelled the capital invested by the Foundation. 2006 grant of £20,000 awarded to Smithdon High School to enable Special Status in Mathematics and Computing. 2008 educational grants exceeding £60,000 are allocated to Snettisham groups and individuals. 2009 The foundation awards a grant of £52,000 to Snettisham Primary School to help towards the costs of replacing the old canteen and dining hall with a new, modern building. This will be adapted as a computer/classroom. 2012 Expansion of the quarry into adjoining Ken Hill land for future extraction of carrstone. 2013 The last of our carrstone is removed from our part of the quarry. The lease for carrstone extraction is extended to 2028 on Ken Hill land.